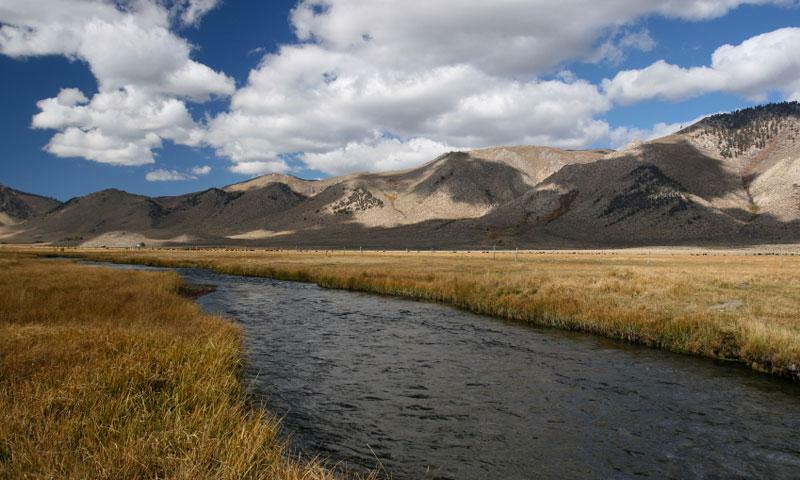 The Owens River offers outdoor recreationists world-class fishing and relaxing paddling. Float the Owens in a canoe, kayak, or raft. Enjoy world class fly-fishing near Benton Crossing Road. The Owens River, at 120 miles long, is one of the most diverse aquatic systems in all of California. From its headwaters in the Eastern Sierra’s, the river continues through Lake Crowley reservoir and continues on past the city of Bishop, where the majority of the water is then distributed into the surrounding farming region and the Los Angeles Aqueduct. For outdoor recreationists, the river boasts world class paddling and fishing. For those staying in Mammoth, your best bet for fishing the Owens is just south near the Benton Crossing Road (head south on US 395 to Benton Crossing Road, then about three miles to the bridge over the river. From here, turn left on a dirt road and find a spot to park.) Expect rainbow, brown, cutthroat, and Kamloop trout. Trout season begins the last Saturday in April and continues until November 15th. Crowley Lake to Pleasant Valley Reservoir - This section of the river is known for medium sized brown Trout, and is a favorite with fly fisherman. Lower Owens River - This is a great spot for easy river access. From Owens River Road, find the public parking lot. Walk either up or down river for prime fishing. Pleasant Valley Reservoir - This is a great section of the river to cast off from a float tube. Expect an array of trout in this area. Note that much of the middle section of the Owens is privately owned and off limits to the public. Make sure to heed all signs and stay on public land. The calm waters of the Owens allow even the casual paddler to enjoy their time on this river. Park one car upstream, one car downstream, and enjoy the float. One popular section begins just outside of Bishop California where US-6 crosses the river. Leave one car here, then park a second car on Warm Springs Road just south of Bishop.